Lord O’Neill was the Colonel of the Antrim Regiment on formation in 1793 and two of his sons were appointed as ensigns. Shortly afterwards the unit, which raised eight companies, became the Royal Antrim Regiment. It was also the 7th Regiment on the Irish Militia roll. The Regiment was mobilised from 1793 to 1802 for the French Revolutionary War and saw action during the 1798 Rebellion. Its service during the ’98 was largely in Leinster: the Antrims were at Baltinglass in County Wicklow on 24 May, Hacketstown, in Carlow, next day and at Kilthomas and Ballinrush in Wexford on the 27th. On 30 May it was at Newtownmountkennedy, Wicklow, and on 1 June at Ballycanew, Wexford, alongside the North Corks. The Antrims were one of several Militia units involved in the action at Tubberneering on 4 June, the others including the Armaghs, the Grenadier Company of the Londonderrys and the Light Company of the Tyrones, as well as the North Corks. Five days later the Regiment was in action again, this time at Arklow, County Wicklow, alongside the units and sub-units involved at Tubberneering, to which were added the Cavans. At Vinegar Hill, overlooking the Slaney river, the Leinster rebels suffered a major defeat on 21 June that led to the end of the rebellion in the province. Once again the order of battle of the government forces included the Antrim Regiment, as well as the Sligo, Meath, Roscommon, and Dublin County units, alongside the composite 1st and 4th Light Battalions, the Londonderrys’ Grenadier Company and the Tyrones’ Light Company. There was one final action for the Antrims, at Hacketstown in Carlow, on 25 June, a month to the day since they had last been there. Only 50 Antrims under Lieutenant R W Gardner were involved in the battle which followed a rebel attack on the town in a bid to obtain weapons and powder. A body of yeomen provided the bulk of the Hacketstown garrison and they and the Antrims fought a brutal battle with the rebels for nine hours, at the end of which the attackers withdrew. Gardner also withdrew his men to Tullow as they were exhausted and had little ammunition remaining. However, the attack on Hacketstown was one of the final such actions of the rebellion which then resolved into small-scale guerrilla warfare in the Wicklow mountains. The Antrim and Louth Militia, as well as the King’s County (Offaly), Limerick City and Leitrim Battalions took part in this final phase of the rebellion. After the rebellion the Antrims remained in Leinster where, the following year, a small party of the Regiment, under Lieutenant Edward Hogg, was involved in an incident that led to a murder and the trial of four soldiers for the crime. Two were found guilty and executed while the others were acquitted. Lieutenant Hogg was court martialled but acquitted, a decision criticised by Lord Cornwallis, the Lord Lieutenant and Commander in Chief in Ireland. Hogg’s commanding officer, Lieutenant Colonel O’Hara, described him as a desperate Orangeman and the source of religious friction within the Antrims. He was eventually removed. This sequence of events began when soldiers led by Hogg called at the Arklow home of the Reverend Gill where the lieutenant demanded whiskey. When he was refused, the soldiers forced their way into the house, stole the whiskey and accused a man who was present, Edward Birch, of being a rebel, seized him and took him from the house. After Birch’s dead body was found, four of the Antrims were arrested and charged with his murder. The Irish Militia was stood down after the Treaty of Amiens of 25 March 1802. However, the so-called Peace of Amiens was short lived and ended on 18 May 1803. 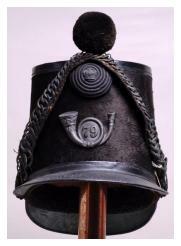 Once again the Militia was embodied and remained so until 1814 and the end of the Napoleonic Wars. This proved to be another brief interval. With Napoleon’s escape from Elba and arrival in France, Europe was again at war and the Militia was mobilised from 1815 to 1816 after which a longer period of peace began and Militia units were reduced to cadre. In the 1833 re-organisation of the Militia throughout the UK, the Antrims became the 79th, or Queen’s Own Royal Rifles Antrim Regiment of Militia. In 1850 Regimental HQ was at Randalstown and the Colonel was George Hamilton Chichester, Marquis of Donegal, who had been appointed on 3 April 1841. Chichester had served in the Peninsular War with both the 7th and 18th Hussars. The Lieutenant Colonel was Thomas Verner, whose appointment dated from 11 June 1842, and there were two majors, George Ferguson, appointed 3 August 1841, and Frederick Seymour, appointed 27 December 1845. Seymour had also served in the 7th Hussars. The oldest commissions in the Regiment were held by Ensigns Abraham Sims (17 June 1813), James Durham (18 December 1813) and W C Magrath (12 June 1816) with most of the other officers having been appointed in the 1830s or 1840s. On 12 December 1854 the Antrims were mobilised for the Crimean War. This period of service lasted until 12 August 1856 and was followed on 24 September 1857 by mobilisation for the Indian Mutiny. The Regiment was stood down again on 10 March 1860 and another period of existence at cadre strength began. With the implementation of the Childers Reforms in 1881, the Queen’s Own Royal Rifles Antrim Regiment became the 4th Battalion Royal Irish Rifles. The Rifles’ recruiting area included Counties Antrim, Down and Louth. On 10 May 1900 the battalion was mobilised for the Second South African War. A service company of volunteers from the battalion, commanded by Captain E M G McFerran, with Lieutenants E J Fraser and P S Murray and 107 Other Ranks, served with 5th Royal Irish Rifles, the South Downs, in South Africa. The Battalion deployed on patrol duties before the blockhouse system was introduced. While the Rifles were stationed at Wolverhoek an advanced post commanded by Lieutenant Murray was attacked by Boers but the enemy was beaten off. On 1 July 1901 an observation post manned by men of the Gordon Highlanders Mounted Infantry was attacked and a patrol from the Antrims’ company was engaged in beating off the Boers who suffered a number of casualties in the encounter. Eight days later the Company moved south 150 miles to the Vet River to man blockhouses and undertake the role of preventing Boers crossing the line. This was arduous work for the Antrims as the Boers made frequent, determined attempts to pass through the blockhouse line. In one such attempt, on 20 July, Boers tried to penetrate the line at a bridge four miles south of the Vet River. One soldier, Private Reavey, who was lying out on patrol with three local watchers, was wounded severely but stayed at his post until reinforcements arrived, thus denying the Boers the opportunity of passing through the line. The Battalion embarked for home at Cape Town on 30 July 1902. Meanwhile, the remainder of the 4th Battalion had been demobilised on 1 November 1900. In 1905 the Honorary Colonel of 4th Royal Irish Rifles was Sir Francis Macnaghten Bt, Lord Lieutenant for County Antrim, and the Commanding Officer was Lieutenant Colonel E J P F Macartney-Filgate. Macnaghten’s son, Sir Harry, was lost in action on 1 July 1916 at the Battle of the Somme and his batman, Private Robert Quigg, earned the Victoria Cross by making seven attempts to find him, each time bringing in another wounded man. With the Haldane Reforms of 1908 the precedence of the former Militia battalions of the Royal Irish Rifles was altered with the Antrims becoming the 3rd (Special Reserve) Battalion and the North Downs the 4th. Although it did not see active service in the First World War the 3rd Battalion was engaged in the important role of recruiting and training drafts, acting as a ‘holding’ unit for soldiers unfit for front-line service and for officers who were too young for such service and helping guard Ireland against possible invasion. The battalion discharged this duty effectively and when the war ended it was again reduced to cadre. Thereafter it was only a title in the Army List but remained until its disappearance in 1953 with the final disbandment of the Militia.